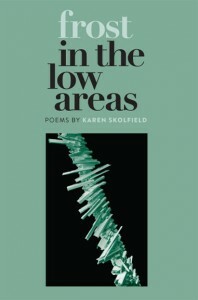 Karen Skolfield‘s book Frost in the Low Areas (2013) won the First Book Award for Poetry from Zone 3 Press. Skolfield is the poetry editor for Amherst Live, a quarterly production of poetry, politics, and more. She’s also a contributing editor at the literary magazine Stirring and her poems have appeared in Apple Valley Review, Memorious, Rattle, Split Rock Review, Sugar House Review, Verse Daily, and others. I would love to tell you that writing is a daily thing—I so admire writers who are at it every day, writing in the gloam of 3:30 a.m., the only time they’re able to carve writing space out of their lives. And I do occasionally fall into a habit of daily writing, but it’s mostly by dare. I do, however, write often, and that feels right for my life and for a working mom with two young kids. My husband and I also work out two writing retreats for me per year at the gorgeous Wellspring House in Ashfield, Massachusetts—treasured weeks of my life. The actual process is just work, but it’s work that occasionally drops me down a slide—when the writing is pulling me along, rather than me pushing. That’s an exciting feeling. I keep a journal of writing notes and ideas and books to consult—the Soldier’s Manual, Army Training, with its fabulous “SMART” acronym, is high on my list right now thanks to my time in the U.S. military. Here’s a sample of one of my “SMART” poems, from UCity Review. Mostly, I love writing advice that makes me laugh—the humorous is perfectly suited to my personality. I love the quote that’s often attributed, probably in error, to Mark Twain: “Substitute ‘damn’ every time you’re inclined to write ‘very’; your editor will delete it and the writing will be just as it should be.” I love the advice to forgive yourself for not writing or for writing poorly, but don’t forgive yourself too often—I’m not sure who said that first. If no one steps up, I’ll claim that advice as my own. Honestly, the best advice I’ve ever gotten is not in words, but in actions. I have a good group of writing friends that impress me every month, every year with their creativity, their output, their struggles, their stick-to-it-ness. I want to keep up with them and bring the same energy to my life as a writer. They inspire me by not giving up, by continuing to come up with new ideas and drive even as we enter the middle of our likely lifespans and we all have other things—kids, work, other interests—pulling us away from a full-time creative mindset. 3. Can you say a little bit about the genesis of your most recent book? This one makes me laugh—because I couldn’t have written the book without my kids’ naptimes! Most of the book was written when my two kids were about age two (the youngest) and four (the oldest), and four of my writing pals and I banded together and took on one of those 30 poems in 30 days challenges. We had so much fun with it that we went to 100 poems. On and on. And then a few of us began assembling manuscripts and sending out to first book contests. As far as the poems go—well, the theme of family dominates, sometimes in a really playful way, sometimes in more concrete and serious ways, and sometimes even a mix of those two approaches. The military breezes through. I love science, so there’s some science-y things. There’s even a dinosaur. My only regret is that my favorite prehistoric creature, glyptodon—think of an armadillo the size of a small car—isn’t in this book. Maybe the next book. Hold on, I have to add that to my writing notes. 4. What are your marketing and promotion habits? I’m not a Twitter gal, but I do like Facebook, and I’m really good at reaching out to editors where I’ve been published to help me spread the word (many of them use Twitter or keep blogs, or use other social media, so yay). I have to say I haven’t been great at self-promotion—especially at setting up readings—but I’m working to improve. I might be great at it by the time my next manuscript is ready to make the rounds. Lots, and continuously. For instance, my husband stumbled on this cool shark tracker website—great white sharks all over the world are tagged and followed by the science group OCEARCH. Oooh, I thought, and wrote a poem about it, but I couldn’t come up with a title. So I kept researching, and found out that great whites are part of a group of sharks called requiem sharks. REQUIEM SHARKS. Is that science handing me a title, or what? 6. Have you had to sacrifice anything in the rest of your life to write? As I’ve mentioned, I don’t sacrifice sleep—well, I might stay up late, but I don’t get up early. Bully to those of you that do! Everyone makes decisions about how to spend their time, and I do try to give my energy to what I deem important, and less to what I deem unimportant. That means very little television but lots of time at soccer games. I work at least part of every evening after my kids are in bed, either on student work or on my own. So I’ve given up—oh, reality TV for a book. That’s a pretty good trade. I wish I had more reality TV to give up; I’d probably have a second book by now. 7. Do you think writing helps you to understand more about yourself and the world, or is advancing as a writer more about learning how to communicate the things you already know? My continued growth as a person, now in my 40s, is intertwined with my growth as a writer. I don’t know how to separate them. I certainly feel a lot more centered and confident now than I did 20 years ago—but is that due to writing or just paying attention as I age? I don’t know. I love where I am right now, and I mostly love who I am right now, even as I work at being a better writer, partner, mother, and friend. This was written by joannemerriam. Posted on Sunday, September 22, 2013, at 12:45 pm. Filed under Um... yeah. Tagged Intermittent Visitors, Karen Skolfield. Bookmark the permalink. Follow comments here with the RSS feed. Both comments and trackbacks are currently closed.